Why I’m Not a Lions Fan (and what it would take for me to be one in the future)! I’m 50 years old and having lived my entire life in the state of Michigan, I’ve always been a Detroit Tigers, Pistons, Red Wings and, until recently, a Lions fan. And, as a result, during my 50 years I’ve celebrated two World Series championships, three NBA championships, four Stanley Cups, and one NFL playoff victory. Yes, that’s right. 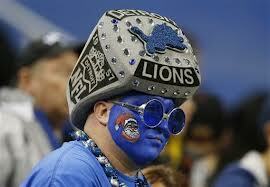 The Lions have won one playoff game during my half century of life. Now I’m not greedy, I’m happy to be a Tiger’s fan and win a World Series every 25 years. I just need to know that my teams are doing what it takes to win and then actually bringing home a championship every couple of decades. So, being a student of organizations and leadership, the question I’ve often asked is why have the Lions won just one playoff game while Detroit’s other professional sports franchises have won multiple world championships during the past 50 years? Well it’s not because of the players, coaches or management, since they’ve changed a dozen times during the past 5 decades. Nor is the city, because if it was, our other professional teams wouldn’t have won any championships either. There’s only one answer that makes any sense, because there’s only one common denominator found during the past 50 Lion’s seasons – the ownership. This isn’t surprising because winning always starts at the top. So if there hasn’t been a NFL championship in 50 years it has to be because of the leadership at the top. I know this to be true because in every organization I’ve been a part of, winning, and losing, always started at the very top.